October is National PT Month! How can we, as PT’s and other Rehab Professionals (OT’s and SLP’s) help keep people out of the hospital and what is our responsibility as part of the Interdisciplinary Team in promoting transitions of care? I talk about these and other topics in my course, Effective Rehabilitation in the Home, Skilled Nursing Facilities and Long-term Care. One of the keys to reducing rehospitalization rates is in identifying Potential Adverse Events. We see them every day in our various therapy environments. The person who is ‘different’ today and can’t do the number of repetitions they did two days ago or the long-term resident who we realize hasn’t been greeting us at the front door every morning like they usually do or the home care patient who is letting the dishes or mail pile up in the kitchen, something they had not done since they achieved increased ambulation with the PT are just some examples. The question is: what do we do about it? And what is our role in helping other professionals (nurses, other rehab professionals, aides) identify these potential events? Since the mid-90’s when payment changed for much of rehab, when volume of therapy delivered became the ‘gold standard’, we often have not been allotted the time to pay attention to these potential risk factors. However, with the dawn of new payment models and the focus on prevention, we are uniquely qualified to observe and make note of our observations to aid in reducing unnecessary rehospitalizations among our elderly population. What types of activities can we engage in to help identify and prevent potential adverse events? Some examples are balance screenings, thoroughly obtaining prior level of function, fall risk screening and prevention (versus waiting for a fall to occur and resultant therapy referral), therapy attendance at patient care meetings and other patient-related daily/weekly or monthly meetings. Setting up a plan within your organization to ensure the therapy team has an understanding of the current level of function of all the residents/patients/clients under your care and are engaged in these and other preventative tasks will go a long way to preventing unnecessary rehospitalizations. 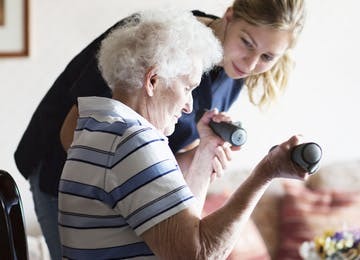 The time has come that this level of involvement is required so that therapists are an integral part of the interdisciplinary team in observing, screening & assessing as well as treating in order to have our organizations be successful in reducing and managing rehospitalization rates in the elderly population.